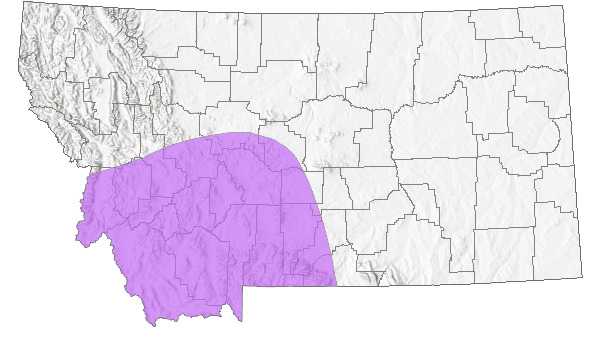 Sparsely distributed across southwest Montana. Populations are generally small, though they occur in habitats not generally impacted by human disturbance or invasive weeds. Building of roads and trails may potentially impact populations. Musk-root is a small, delicate, musky-scented herbaceous perennial, 5-20 cm tall. The several basal leaves have long petioles and blades divided into threes 2-3 times, with the ultimate segments broadly egg-shaped and lobed. There is one opposite pair of smaller stem leaves which are less dissected. Usually 5 flowers are borne in a compact head-like inflorescence at the tip of the stem. The inconspicuous, yellowish-green flowers, 5-8 mm wide, are of two types: outside flowers usually have 3 sepals and 5 united petals, while the terminal flowers have 2 sepals and 4 united petals. The sepals are united to the wall of the ovary. The small dry fruit has 4-5 seeds. Flowering occurs in June and early July, and fruiting continues through July. The leaves of this unusual plant resemble those of Aquilegia spp., and the flowers superficially resemble those of some Saxifraga spp., but it differs in having only 2-3 sepals. This monotypic family is most closely related to the Valerian Family from which it differs in having twice as many stamens as petals. A circumboreal plant of the upper Midwest and Canada extending south to southern Minnesota, Wisconsin, northern Illinois and northern Iowa. Disjunct populations in the Catskill Mountains of New York. Vernally moist places in the mountains at the bottom of undisturbed, open rock slides that have cold air drainage. Populations are often small. Plants have been observed growing where cold air flow is channelled beneath rock slides. At one location where roads and trails were built across rock slides disrupting cold air flow from beneath the rocks, musk-root was not found in otherwise suitable habitat. 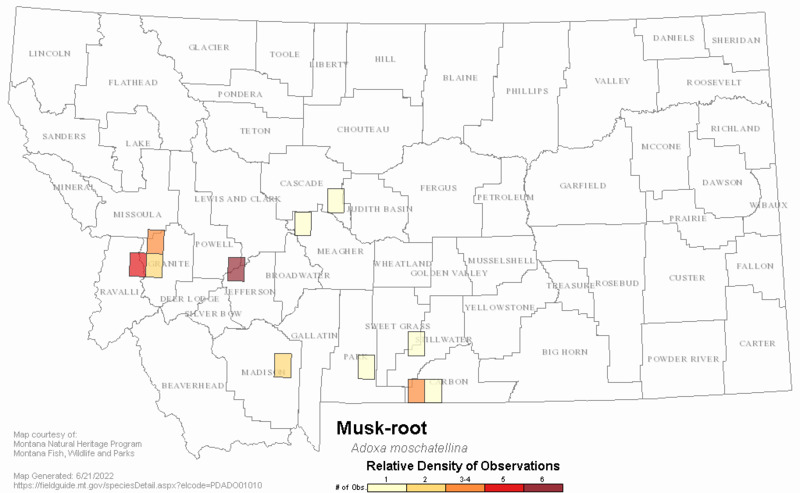 Web Search Engines for Articles on "Musk-root"